Are you a Musical Voice Nerd? Here are the answers (in red) to our brand new Musical Theatre Voice Nerd quiz. I’ve given you growlights and mineral supplements, what do you want from me, blood? Who could top or make this comic opera more compelling? Let just one person shake my hand? It’s the land of naked marble boys! 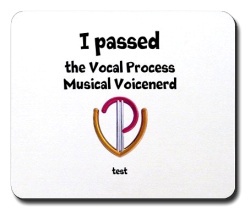 No prizes for this one, but if you get all the answers right then why not reward yourself with a brand new “I passed the Vocal Process Musical Voicenerd test” mousemat from the Vocal Process Voicenerd Collection – you’ve earned it!